ok, so now that our tired, burned out router has been replaced, i can post again! yay! busy weekend. here's one i was trying to post the other day. 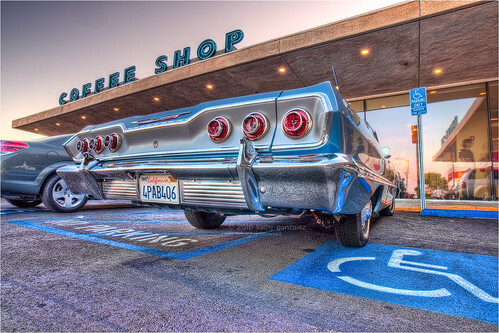 i think its a 1963 impala. i seem to like these cars from the back end more than the front. maybe they're just more distinctive from this point of view. this model wasn't rockin' the over the top fins of earlier models, but i don't think i had seen this year in my collection yet. owners were nice enough to wait for me to finish before they left. thanks, you guys!